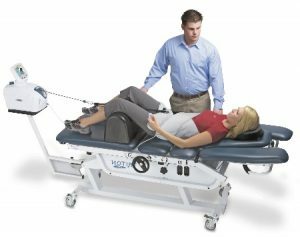 Spinal decompression therapy is executed with a mechanical traction table which provides a continuous, cyclical or intermittent force along the long axis of the spine. The traction force reduces unwarranted stress on the joints, nerves and connective tissue of the neck and back, relieving pain, improving mobility and enhancing function. Spinal decompression therapy is often used to treat disc herniations, a bulge of the gel-like substance within the interverterbral disc. As the tissue is stretched with computer-controlled tension, the distraction force creates a negative pressure within the disc resulting in oxygenation, hydration and nutrification of the disc material, promoting proper healing. The mechanical traction facilitates the reduction of a disc herniation or a bulge. Furthermore, the distraction force reduces the mechanical impingement of the spinal nerve roots, lessening upper extremity or lower extremity (sciatic) pain. You lie face down or face up on a computer-controlled mechanical traction table while fully clothed. For lumbar (low back) traction, you are fitted with a harness around your pelvis and another around your trunk. For cervical (neck) traction, you are fitted with a harness that is strapped around your head. A qualified practitioner will operate the machine, generating a treatment protocol tailored to your specific condition. Treatment may last 20 to 30 minutes and you may require 15 to 20 treatments over six to eight weeks. This will be dependent on the type of condition being treated, severity of condition and response to therapy. If you physician has recommended decompression or traction therapy for you back or neck pain then don’t hesitate to call our office and schedule your initial appointment.